Piazza Sidney Sonnino in Trastevere in central Rome is situated on a crossroads between the traditional and the modern city in a quarter which witnessed much political intervention. 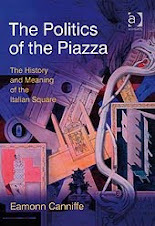 The piazza contains in its visible forms, and some less visible ones, a large chronological span. Its present form is perhaps too open, lacking sufficient definition to be regarded as the classic urban room. Yet the intensity with which the different elements of its history are incorporated would appear to reinforce the sense of place if one peels back the historical layers. The most immediate and intrusively apparent feature is the presence of Viale di Trastevere with its heavy traffic, tram lines and platforms, part of the late nineteenth century improvements to the functioning of the new national capital. The commercial developments from the 1930s on the eastern side of the boulevard are generic buildings of their period, set back slightly to create a wide pavement in front of them with lines of plane trees breaking up the space. The insertion of the road, though, was required to acknowledge the presence of historical remains in the objectification of the 'Casa di Dante' as a relic of the medieval city. To the informed observer, this juxtaposition of new development, building conservation and modern traffic planning epitomises aspects of the modern city, but one should also be aware that this only represents the present stratum. Slightly further from Viale di Trastevere, within the depth of the block, but on the southern end in a subterranean zone are a set of rooms, the remains of Roman civic infrastructure in the barracks of the VII cohort of ‘vigili’ or fire watchers discovered by accident in the mid nineteenth century and important evidence of the daily life of lesser functionaries in the ancient city. Presently roofed by a concrete slab, it is difficult to discern the historic situation, except to realise how the process of urban sedimentation has raised the street level of the ancient Via Aurelia several metres to the present Via Lungaretta, the medieval pilgrimage route to the Vatican. On the other side of Viale di Trastevere and adjacent to that road is the church of San Crisogono, the oldest site of public Christian worship in the city, which dates from the fourth century. The present facade records the seventeenth century restoration of the church under the patronage of the papal nephew Cardinal Scipione Borghese, but the columns, both on the porch and in the interior, are themselves spolia from other earlier pagan buildings. Again a subterranean zone on a slightly different alignment embodies the earliest historical layer of the basilica, while the campanile, the central vertical point of the entire dates from the medieval rebuilding of the basilica.